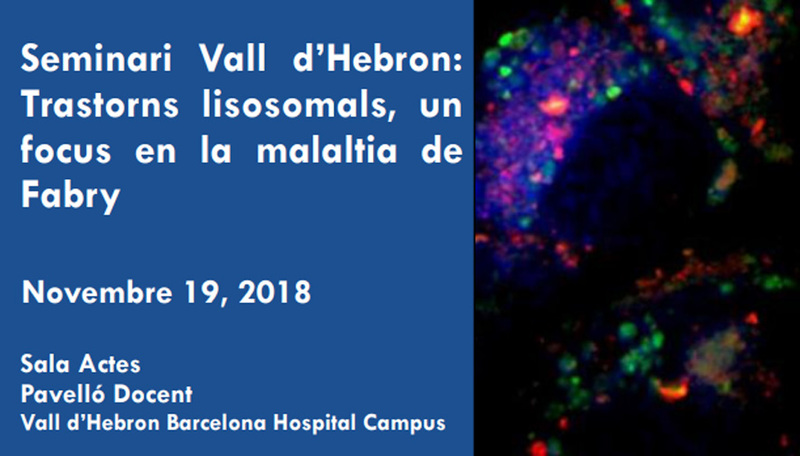 Next Monday, November 19, Vall d’Hebron will hold a seminar focused on Lysosomal Rare Disorders: Focus on Fabry Disease. The seminar is part of the Rare Diseases Program at the Vall d’Hebron Campus, in collaboration with the European Commission, the Center for Biomedical Research Network on Bioengineering, Biomaterials and Nanomedicine (CIBER-BBN) and the CIBBIM-Nanomedicine at Vall d Hebron Research Institute (VHIR) through the Smart-4-Fabry project. It will be opened by the Manager of Vall d’Hebron Hospital, Dr. Vincenç Martínez Ibáñez, who will be accompanied by authorities of the health administration, clinical management and research in Rare Diseases. The seminar focuses on Fabry disease given the important number of findings on physiopathological and molecular mechanisms, and on therapeutics, which have appeared in recent years. Fabry disease (FD) is a rare disorder that is part of inherited and complex lysosomal metabolic diseases. It is caused by a genetic alteration in the GAL gene that encodes for the alpha-galactosidase A protein (GALA) and that, accordingly, determines a deficiency of the GALA enzymatic activity and an accumulation of the globotriaosylceramide sphingolipid (Gb3) and its derivatives such as the deacetylated form (Lyso-Gb3), with pro-inflammatory properties and proliferative stimulants. FD is inherited in an X-linked chromosome, which determines an affectation of men and women generally with different degrees of severity, since women by having 2 X chromosomes and only one of them with the genetic variant, usually exhibit a slower progression of the disease and usually less aggressive than in men, but far from being of a universally benign character. In the first scientific session, the speakers will present the findings regarding biomarkers, genetic variants and treatment protocols. At this same session, the introduction of magnetic resonance will be a very innovative topic as one of the most accurate tools for an early diagnosis and prognostic marker. Likewise, the latest results of the Canadian multidisciplinary statewide study (Canadian Fabry Disease Initiative) will be presented. The second part of the scientific session will deal with therapeutic findings in lysosomal diseases in general: tools to cross the hematoencephalic barrier, innovative aspects of nanomedicine to improve the efficacy of enzymatic treatment, and gene therapy applied to various lysosomal diseases. In order to present these diverse subjects, we count on the participation of professionals of excellent reputation, both national and international. The majority of the interventions will be in English and a simultaneous translation service will be made available to assistants to facilitate communication. In the afternoon, there will be an open meeting between patients with lysosomal disorders and the representatives of the associations, together with those responsible for the administration, in order to have an open exchange of opinions between the different actors and health professionals. The objective is to show the expectations fulfilled and those not reached regarding the treatment of lysosomal diseases and, together with patients and professionals, design projects and collaborative actions aimed at achieving a rapid diagnosis, an easy access to treatments for those who meet the indication criteria, and, finally, a better quality of life for people affected by rare diseases.